本发明公开一种血液透析用体外循环管路，抗凝血涂层，抗凝血涂层的制备方法以及血液透析用体外循环管路的制备方法，其中抗凝血涂层采用共挤涂布工艺设置在所述管路内表面；与现有的血液透析用体外循环管路相比，本发明的血液透析用体外循环管路的血小板吸附量为平均10个/50000μm2，而传统管路的血小板吸附量为平均76个/50000μm2，可见本发明很大程度降低了血凝、血栓副作用，对提高血透的质量有明显的促进作用；并且管路涂层制备采用自动共挤涂布工艺涂布到管路上，结合稳固，与传统通过在管路中注入抗凝血药物管路相比，本管路可以长期使用，操作方便，综合使用成本降低。 The present invention discloses a bypass line for hemodialysis, an anticoagulant coating anticoagulant coating preparation and production method extracorporeal hemodialysis line, wherein the coating is applied by coextrusion coating anticoagulant process surface disposed within said conduit; compared with conventional hemodialysis bypass conduit, according to the present invention hemodialysis platelet adsorption bypass line average 10 / 50000μm2, traditional line the average amount of platelet adhesion to 76 / 50000μm2, visible to a large extent the present invention reduces the blood coagulation, thrombus effects, significant promoting effect on improving the quality of hemodialysis; preparation and coating line automatic coating coextrusion coating process cloth to the pipeline, with a solid, by injecting with conventional anticoagulants compared conduit line, the line can be long-term use, easy to operate, reducing overall cost. 本发明涉及一种循环管路及其制备方法，尤其涉及一种血液透析用抗凝血高分子仿生体外循环管路。  The present invention relates to a circulation line and a preparation method, particularly to a biomimetic extracorporeal hemodialysis line anticoagulant polymer. 当血液与外来生物材料接触时，血浆蛋白质会迅速吸附沉积在外来生物材料表面，形成蛋白质吸附层。  When foreign biological material in contact with the blood, adsorption of plasma protein rapidly deposited on the surface of foreign biological material, protein adsorption layer is formed. 蛋白质吸附层的种类、数量、取向等与材料的表面性质有关，且会影响到血小板和材料表面的相互作用。 Protein adsorption layer type, quantity, orientation, etc. For the surface properties of the materials, and can affect the interaction of platelets and the surface of the material. 部分蛋白质会促进血小板的黏附，如纤维蛋白原、VWF、 纤连蛋白以及玻连蛋白等，其中纤维蛋白原对血小板的黏附起决定作用。 Part of the protein will promote platelet adhesion, such as fibrinogen, the VWF, fibronectin, vitronectin and the like, wherein the adhesion of fibrinogen to platelets play a decisive role. 吸附在材料表面的蛋白质的变性和活化将启动内、外源凝血途径，同时血小板的黏附、活化和释放又进一步引起血小板的凝血反应，促使纤维蛋白原转化为纤维蛋白。 The exogenous coagulation pathway proteins adsorbed on the surface of the material will start denaturation and activation, and platelet adhesion, activation and the release of yet further cause platelet coagulation, fibrinogen is converted to promote fibrin. 不溶性的纤维蛋白和血小板使血液凝固，形成血栓。 Insoluble fibrin platelets and blood coagulation, thrombosis. 另外，生物材料还可直接引起凝血因子活化和补体系统激活而导致血栓。 Further, the biological material may also directly cause activation of coagulation factors and activation of the complement system and cause thrombosis. 抗凝血材料的血液相容性主要由材料表面性能（组分、结构、形态等)决定。 Blood compatibility anticoagulant material is mainly determined by the surface properties of materials (components, structure, shape, etc.). 材料表面性能会影响血液中白蛋白、纤维蛋白原、血小板等组分的黏附，进而引发凝血和血栓的形成。 The surface properties of the material will affect the adhesion of blood components as albumin, fibrinogen, platelets, and trigger the coagulation and thrombus formation. 阻止血栓形成主要是在材料上形成血液相容性表面。 To prevent thrombosis formed mainly on the surface of hemocompatible material. 目前普遍通过对材料进行表面改性来提高材料的血液相容性，包括改善表面的亲/疏水性能、电荷分布、微相分离结构等方法。 Now generally by surface modification of the material to improve blood compatibility of materials, including improved affinity surface / hydrophobic properties, charge distribution, micro phase separation structure or the like. 总的来说，只要在某种程度上能抑制或阻止凝血因子激活、血小板黏附与聚集、红细胞黏附和补体系统激活这4种凝血途径中的一种或几种凝血途径发生的材料都具有抗凝血性能。 In general, as long as can be suppressed to some extent or preventing activation of clotting factors, platelet adhesion and aggregation, erythrocyte adhesion and activation of the complement system in the coagulation pathway of these four materials of one or more of the coagulation pathway has occurred anti clotting properties. 虽然目前抗凝血材料无论是在理论上、还是在实验上的研究都取得了重大进展，但是就抗凝血材料的临床应用而言，这一难题至今还没有得到很好的解决。 Although anticoagulant material either in theory or in experimental studies have made significant progress, but it is in terms of clinical application of anti-clotting materials, this problem has not been solved. 因此，以生物材料与血液接触之后的凝血与溶血机制为理论指导，设计相应的材料使其具有良好的抗凝血性能至关重要。 Therefore, biomaterials and coagulation and hemolysis mechanism after contact with blood theoretical guidance to design appropriate materials it has a good performance is critical anticoagulant. 设计的原则包括阻抗蛋白质吸附、减少血小板的黏附和聚集、抑制内源性凝血因子的活化、溶解已形成的血栓、促进材料伪内膜化、仿生化等。 Design principle includes an impedance protein adsorption, platelet adhesion and aggregation to reduce, inhibit the activation of endogenous coagulation factor, thrombolytic already formed lining of pseudo-promoting material, bionic like. 以此设计原则为基准，通过各种技术对材料进行改性处理，可制备出一系列具有生物相容性的抗凝血材料。 In this reference design principles, materials modified by a variety of processing techniques, may be prepared by a series of anticoagulant material having biocompatibility. 有鉴于上述现有技术存在的缺陷，本发明人基于从事此类产品设计制造多年丰富的实务经验及专业知识，并配合学理的运用，积极加以研究创新，以期创设一种新型抗凝血体外循环管路及其制备方法，使其更具有实用性。  In view of the above disadvantages of the prior art, the present invention is based on such products for many years engaged in the design and manufacture a wealth of practical experience and professional knowledge, and with the use of scientific principle, be actively pursued research and innovation, in order to create a new type of anticoagulant extracorporeal blood line and its preparation method, it is more practical. 经过不断的研究、设计，并经反复试作试制样品及改进后，终于创设出确具实用价值的本发明。 Through continuous research, design, and after repeated trial samples and test for the improved, and finally the creation of the present invention indeed has practical value. 本发明的主要目的在于，克服现有的抗凝血体外循环管路抗凝血效果不佳，提供一种新的血液透析用体外循环管路及其制备方法，从而更加适于实用，且具有产业上的利用价值。  The main object of the present invention is to overcome the existing poor anticoagulant bypass conduit anticoagulant effect, provide a new conduit for hemodialysis and extracorporeal circulation preparation method, which is more suitable for practical and it has a utility value on the industry. 本发明的目的及解决其技术问题是采用以下技术方案来实现的。  objects and to solve the technical problem of the invention is achieved by the following technical solutions. 依据本发明提出血液透析用体外循环管路，所述管路内表面设置一层抗凝血涂层。 Hemodialysis is proposed according to the invention with a bypass conduit, an anticoagulant coating provided on the surface layer of said conduit. 具体的，前述的血液透析用体外循环管路，所述抗凝血涂层采用共挤涂布工艺设置在所述管路内表面。  Specifically, the bypass line with hemodialysis, an anticoagulant coating is applied by the co-extrusion coating process is provided in a surface of said conduit. 2)利用步骤1)的产物制备含磺酸基的聚（2-甲氧基乙基丙烯酸酯），得到目标涂层。  2) using the Step 1) Preparation of the product of the sulfonic acid group-containing poly (2-methoxyethyl acrylate), to give the target coating. 具体的，前述的血液透析用体外循环管路，所述步骤2)的操作步骤如下:步骤1)反应结束后，将产物滴入不断搅拌的无水乙醚或石油醚，得到白色絮状沉淀，过滤，然后将得到的产物再用氯仿或四氢呋喃溶解，再在乙醚或石油醚中沉淀，反复三次，最后真空干燥得到含磺酸基的聚(2-甲氧基乙基丙烯酸酯）。  Specifically, the blood dialysis bypass conduit, said step 2) the following steps: after step 1) reaction, the product was added dropwise with constant stirring anhydrous diethyl ether or petroleum ether, to give a white floc precipitate was filtered, and the resulting product was then dissolved in chloroform or tetrahydrofuran, reprecipitated in diethyl ether or petroleum ether, repeated three times, and finally dried in vacuo to give a sulfonic acid group-containing poly (2-methoxyethyl acrylate) . 具体的，前述的血液透析用体外循环管路，所述步骤2)的操作步骤如下:利用步骤1)的产物，采用自由基聚合方法制备含磺酸基的聚(2-甲氧基乙基丙烯酸酯）。  Specifically, the blood dialysis bypass conduit, said step 2) the following steps: Step 1 using) of the product with a free radical polymerization process for preparing a sulfonic acid group-containing poly (2-methoxy ethyl acrylate). 具体的，前述的血液透析用体外循环管路，所述自由基聚合反应中采用氮气保护， 聚合的溶剂为甲醇、乙醇、异丙醇、氯仿、四氢呋喃、丙酮中的一种或任意两种及两种以上混合物;反应所用的催化剂为偶氮二异丁腈或偶氮二异庚腈自由基引发剂。  Specifically, the bypass line with hemodialysis, the radical polymerization using nitrogen, the polymerization solvent is methanol, ethanol, isopropanol, chloroform, tetrahydrofuran, acetone or any one and a mixture of two kinds of two or more; catalyst used was azobisisobutyronitrile or azobis isobutyl nitrile heptyl radical initiator. 3)将步骤2)制备的产物配成质量比为0.1%_15%的溶液，采用共挤涂布方法在管路基材上成膜，得到目标产物。  3) The product of step 2) is formulated mass ratio of 0.1% _15% solution of co-extrusion coating method using a film on the substrate pipe, to give the desired product. 其中共挤涂布工艺具体是指在生产管路基材的同时将涂层与基材一起共挤成型，涂层与基材有较好的结合性能。 Wherein the co-extrusion coating process specifically refers to the production line simultaneously with the coextruded substrate coating and the substrate, the substrate coating has good binding properties. 具体的，前述的血液透析用体外循环管路的制备方法，所述步骤3)中配制溶液所用的溶剂为甲醇、四氢呋喃、二甲基甲酰胺、二甲基亚砜、二甲基乙酰胺、丙酮中的一种或任意两种或两种以上的混合物。  Specifically, the preparation method of hemodialysis bypass conduit, the step 3) was prepared in the solvent used is methanol, tetrahydrofuran, dimethylformamide, dimethyl sulfoxide, dimethyl acetamide, one or any two or more of the acetone mixture. 具体的，前述的血液透析用体外循环管路的制备方法，所述步骤2)的操作步骤如下：步骤1)反应结束后，将产物滴入不断搅拌的无水乙醚或石油醚，得到白色絮状沉淀，过滤，然后将得到的产物再用氯仿或四氢呋喃溶解，再在乙醚或石油醚中沉淀，反复三次，最后真空干燥得到含磺酸基的聚(2-甲氧基乙基丙烯酸酯）。  Specifically, the preparation method of hemodialysis bypass conduit, said step 2) the following steps: after step 1) reaction, the product was added dropwise with constant stirring anhydrous diethyl ether or petroleum ether, to give a white flocculent precipitate was filtered, and the resulting product was then dissolved in chloroform or tetrahydrofuran, reprecipitated in diethyl ether or petroleum ether, repeated three times, and finally dried in vacuo to give a sulfonic acid group-containing poly (2-methoxyethyl Acrylate). 具体的，前述的血液透析用体外循环管路的制备方法，所述步骤2)的操作步骤如下:利用步骤1)的产物，采用自由基聚合方法制备含磺酸基的聚(2-甲氧基乙基丙烯酸酯）； 自由基聚合反应中采用氮气保护，聚合的溶剂为甲醇、乙醇、异丙醇、氯仿、四氢呋喃、丙酮中的一种或任意两种或两种以上的混合物;反应所用的催化剂为偶氮二异丁腈或偶氮二异庚腈自由基引发剂。  Specifically, the preparation method of hemodialysis bypass conduit, said step 2) The procedure is as follows: Using the product of Step 1), using poly (2 prepared containing the sulfonic acid group-radical polymerization process - methoxyethyl acrylate); a radical polymerization reaction mixture was blanketed with nitrogen, a polymerization solvent is methanol, ethanol, isopropanol, chloroform, tetrahydrofuran, one or any two or more of acetone ; catalyst used was azobisisobutyronitrile or azobis isobutyl nitrile heptyl radical initiator. 与现有的血液透析用体外循环管路相比，本发明的血液透析用体外循环管路的血小板吸附量为平均10个/50000μηι2,而传统管路的血小板吸附量为平均76个/50000μηι2,可见本发明很大程度降低了血凝、血栓副作用，对提高血透的质量有明显的促进作用;含磺酸基的聚（2-甲氧基乙基丙烯酸酯）高分子仿生涂层，该涂层具有亲疏水两性特点，血小板在本仿生涂层黏附少，同时黏附的血小板不变形;并且管路涂层制备采用自动共挤涂布工艺涂布到管路上，结合稳固，与传统通过在管路中注入抗凝血药物管路相比，本管路可以长期使用，操作方便，综合使用成本降低。  Compared with the conventional extracorporeal circulation line for hemodialysis, hemodialysis with the present invention, the amount of platelet adhesion bypass line average 10 / 50000μηι2, platelet adsorption conventional line average 76 / 50000μηι2, visible to a large extent the present invention reduces the blood coagulation, thrombus effects, significant promoting effect on improving the quality of hemodialysis; sulfonic acid group-containing poly (2-methoxyethyl acrylate) polymer biomimetic coating layer, the coating having a Hydropathy amphoteric characteristics, fewer platelets present in biomimetic coating adhesion while adhesion of platelets is not deformed; and pipe coatings prepared using coextrusion coating process is applied to the automatic pipeline, binding solid, and by injecting the conventional anticoagulants compared conduit line, the line can be long-term use, easy to operate, reducing overall cost. 上述说明仅是本发明技术方案的概述，为了能够更清楚了解本发明的技术手段， 并可依照说明书的内容予以实施，以下以本发明的较佳实施例详细说明如后。  The above description is only an overview of the technical solution of the present invention, in order to more fully understood from the present disclosure, may be implemented in accordance with the contents of the specification, as will hereinafter be described in detail the preferred embodiment of the present invention. 图2为现有技术血液透析用体外循环管路黏附血小板的电镜图谱，电镜放大15000 倍。  FIG. 2 is a prior art hemodialysis platelet adhesion Electron Micrographs with bypass conduit, 15,000 times enlarged SEM. 为更进一步阐述本发明为达成预定发明目的所采取的技术手段及功效，对依据本发明提出的血液透析用体外循环管路及其制备方法其具体实施方式、特征及其功效，详细说明如后。  To further elaborate the technical means and effects the present invention is predetermined to achieve the object of the invention is adopted, on the basis of the present invention is proposed hemodialysis bypass conduit and a method for preparing specific embodiments, features and effects of the detail as explained later. 1.将质量百分比为10%的2-丙烯酰胺-2-甲基丙磺酸、质量百分比为70%的甲基丙烯酸乙酯和质量百分比为20%的甲基聚乙二醇丙烯酸酯混合，在氮气保护下聚合，反应温度控制在60°C，反应16小时。  1. 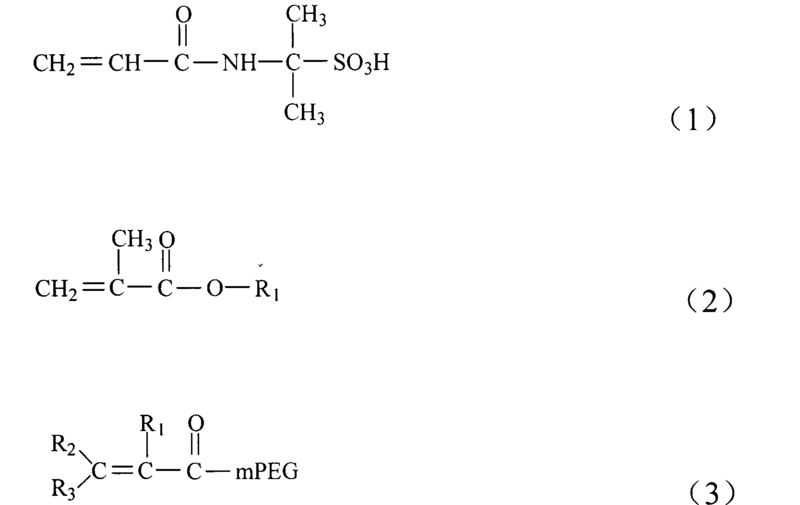 The mass percentage of 10% 2-acrylamido-2-methylpropanesulfonic acid, 70% mass percentage of ethyl methacrylate and 20% by mass of methyl polyethylene glycol acrylate mixed ester, the polymerization under nitrogen, the reaction temperature was controlled at 60 ° C, for 16 hours. 2.步骤1反应结束后，将产物滴入不断搅拌的无水乙醚中，得到白色絮状沉淀，过滤，然后将得到的产物再用氯仿中溶解，再在乙醚中沉淀，反复三次，最后真空干燥得到含磺酸基的聚(2-甲氧基乙基丙烯酸酯）。  Step 2. After completion of the reaction 1, the product in anhydrous ether was added dropwise with constant stirring to give a white flocculent precipitate was filtered, and the resulting product was then dissolved in chloroform, reprecipitated in diethyl ether, repeated three times , and finally dried in vacuo to give a sulfonic acid group-containing poly (2-methoxyethyl acrylate). 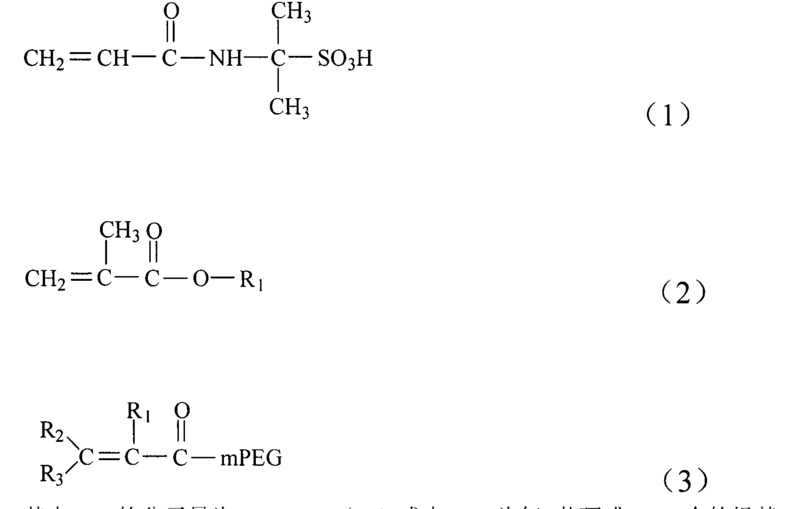 其中mPEG的分子量为600-5000g/mol，式中Ri-Rs为氢、苯环或C1-C6个的烃基。 Molecular weight  wherein the mPEG is 600-5000g / mol, wherein Ri-Rs is hydrogen, phenyl or C1-C6 hydrocarbyl groups. 4.将步骤3的产物配成质量比为3%的甲醇溶液，采用共挤涂布方法在管路PVC基材上成膜，得到目标产物血液透析用体外循环管路。  4. The product of step 3 was formulated mass ratio of 3% solution in methanol, co-extrusion coating method using a film on the substrate PVC tubing, to give the desired product extracorporeal hemodialysis line. 1.将质量百分比为7%的2-丙烯酰胺-2-甲基丙磺酸、质量百分比为75%的甲基丙烯酸乙酯和质量百分比为18%的甲基聚乙二醇丙烯酸酯混合，在氮气保护下聚合，反应温度控制在50°C，反应18小时。  1. The weight percentage of 7% acrylamide-2-methylpropanesulfonic acid, 75% mass percentage of ethyl methacrylate and 18% by mass percentage of methyl polyethylene glycol acrylate mixed ester, the polymerization under nitrogen, the reaction temperature is controlled at 50 ° C, for 18 hours. 2.采用自由基聚合方法制备含磺酸基的聚(2-甲氧基乙基丙烯酸酯），其中自由基聚合反应中采用氮气保护，聚合的溶剂为甲醇，反应所用的催化剂采用偶氮二异丁腈，制备得到含磺酸基的聚(2-甲氧基乙基丙烯酸酯）。  2. Preparation of the sulfonic acid group-containing poly (2-methoxyethyl acrylate) by free radical polymerization method wherein a radical polymerization reaction was blanketed with nitrogen, using a polymerization solvent of methanol as catalyst, used in the reaction azobisisobutyronitrile, was prepared to give a sulfonic acid group-containing poly (2-methoxyethyl acrylate). 其中mPEG的分子量为600-5000g/mol，式中Ri-R3为氢、苯环或C1-C6个的烃基。  wherein the mPEG molecular weight of 600-5000g / mol, wherein Ri-R3 are hydrogen, phenyl or C1-C6 hydrocarbyl groups. 4.将步骤3的产物配成质量比为12%的丙酮溶液，采用共挤涂布方法在管路PVC基材上成膜，得到目标产物血液透析用体外循环管路。  4. The product of Step 3 is formulated mass ratio of 12% acetone solution, co-extrusion coating method using a film on the substrate PVC tubing, to give the desired product extracorporeal hemodialysis line. 1.将质量百分比为12%的2-丙烯酰胺-2-甲基丙磺酸、质量百分比为66%的甲基丙烯酸乙酯和质量百分比为22%的甲基聚乙二醇丙烯酸酯混合，在氮气保护下聚合，反应温度控制在80°C，反应10小时。  1. The weight percentage of 12% 2-acrylamido-2-methylpropanesulfonic acid, 66% mass percentage of ethyl methacrylate and 22% by mass percentage of methyl polyethylene glycol acrylate mixed ester, the polymerization under nitrogen, the reaction temperature was controlled at 80 ° C, for 10 hours. 2.步骤1反应结束后，将产物滴入不断搅拌的无水乙醚中，得到白色絮状沉淀，过滤，然后将得到的产物再用氯仿中溶解，再在石油醚中沉淀，反复三次，最后真空干燥得到含磺酸基的聚(2-甲氧基乙基丙烯酸酯）。  Step 2. After completion of the reaction 1, the product in anhydrous ether was added dropwise with constant stirring to give a white flocculent precipitate was filtered, and the resulting product was then dissolved in chloroform, reprecipitated in petroleum ether, repeatedly three times, and finally dried in vacuo to give a sulfonic acid group-containing poly (2-methoxyethyl acrylate). 其中mPEG的分于量为600-5000g/mol，式中Ri-R3为氢、苯坏或C1-C6个的烩基。  wherein the mPEG to a partial amount 600-5000g / mol, wherein Ri-R3 are hydrogen, benzyl or C1-C6 bad braised th groups. 4.将步骤3的产物配成质量比为7%的四氯呋喃溶液，采用共挤涂布方法在管路PVC基材上成膜，得到目标产物血液透析用体外循环管路。  4. The product of step 3 was formulated mass ratio of 7% solution of tetrahydrofuran, co-extrusion coating method using a film on the substrate PVC tubing, to give the desired product extracorporeal hemodialysis line. 1.将质量百分比为14%的2-丙烯酰胺-2-甲基丙磺酸、质量百分比为72%的甲基丙烯酸乙酯和质量百分比为14%的甲基聚乙二醇丙烯酸酯混合，在氮气保护下聚合，反应温度控制在75°C，反应13小时。  1. 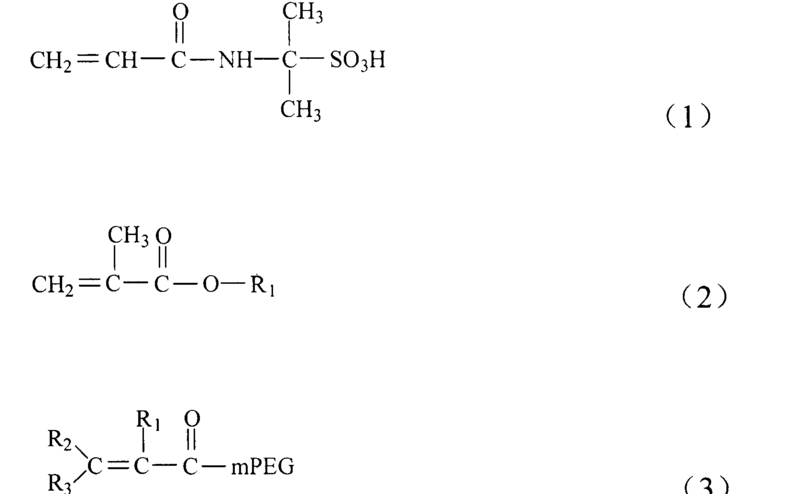 The mass percentage of 14% 2-acrylamido-2-methylpropanesulfonic acid, 72% mass percentage of ethyl methacrylate and 14% by mass percentage of methyl polyethylene glycol acrylate mixed ester, the polymerization under nitrogen, the reaction temperature was controlled at 75 ° C, the reaction for 13 hours. 2.采用自由基聚合方法制备含磺酸基的聚（2-甲氧基乙基丙烯酸酯），其中自由基聚合反应中采用氮气保护，聚合的溶剂为异丙酮，反应所用的催化剂采用偶氮二异丁腈，制备得到含磺酸基的聚(2-甲氧基乙基丙烯酸酯）。  2. 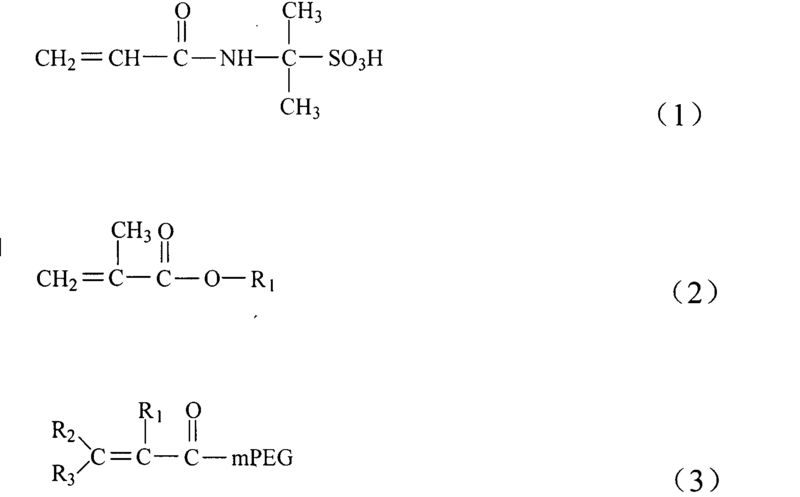 Preparation of the sulfonic acid group-containing poly (2-methoxyethyl acrylate) by free radical polymerization method wherein a radical polymerization reaction was blanketed with nitrogen, the polymerization solvent is isopropyl alcohol, the catalyst used in the reaction using azobisisobutyronitrile, was prepared to give a sulfonic acid group-containing poly (2-methoxyethyl acrylate). 4.将步骤3的产物配成质量比为11 %的二甲基亚砜溶液，采用共挤涂布方法在管路PVC基材上成膜，得到目标产物血液透析用体外循环管路。  4. The product of Step 3 is formulated mass ratio of 11% dimethyl sulfoxide solution, co-extrusion coating method using a film on the substrate PVC tubing, to give the desired product hemodialysis bypass tube road. 以上所述，仅是本发明的较佳实施例而已，并非对本发明作任何形式上的限制，虽然本发明已以较佳实施例揭露如上，然而并非用以限定本发明，任何熟悉本专业的技术人员，在不脱离本发明技术方案范围内，当可利用上述揭示的技术内容做出些许更动或修饰为等同变化的等效实施例，但凡是未脱离本发明技术方案的内容，依据本发明的技术实质对以上实施例所作的任何简单修改、等同变化与修饰，均仍属于本发明技术方案的范围内。  The above are only preferred embodiments of the present invention only, not limitation of the present invention in any form, although the invention has been disclosed above by the preferred embodiments, but not intended to limit the present invention, anyone familiar with Those skilled in the art, without departing from the scope of the technical solution of the present invention, when some minor modifications may be made using the techniques disclosed content equivalent embodiments or equivalent modifications to change, but all without departing from the technical solutions of the present invention , any simple modification based on the technical essence of the present invention is made to the above embodiment of the embodiment, the equivalent changes and modifications as would fall within the scope of the technical solutions of the present invention. 1. 一种血液透析用体外循环管路，其特征在于，所述管路内表面设置一层抗凝血涂层， 所述抗凝血涂层采用共挤涂布工艺设置在所述管路内表面，所述抗凝血涂层的制备方法包括如下步骤： 1) 将质量百分比为1~25%的2-丙烯酰胺-2-甲基丙磺酸、质量百分比为50-75%的甲基丙烯酸乙酯和质量百分比为10-35%的甲基聚乙二醇丙烯酸酯混合并发生聚合反应，反应温度为30-90°C，反应时间为3-25小时； 2) 利用步骤1)的产物制备含磺酸基的聚(2-甲氧基乙基丙烯酸酯），得到目标涂层。 A hemodialysis, wherein a bypass conduit, an inner surface of said conduit a coating layer of anticoagulant, the anticoagulant coextrusion coating line employed in the coating process is provided inner surface coating method for preparing the anticoagulant comprises the following steps: 1) the percentage of 1 to 25% by mass of 2-acrylamido-2-methylpropanesulfonic acid, 50-75% by mass percentage a ethyl acrylate and 10 to 35% by mass percentage of methyl polyethylene glycol acrylate and a polymerization reaction mixture, the reaction temperature is 30-90 ° C, the reaction time is 3-25 hours; 2) using the step 1) the sulfonic acid group-containing product prepared poly (2-methoxyethyl acrylate), to give the target coating. 2. 根据权利要求1所述的血液透析用体外循环管路，其特征在于，所述步骤2)的操作步骤如下:步骤1)反应结束后，将产物滴入不断搅拌的无水乙醚或石油醚中，得到白色絮状沉淀，过滤，然后将得到的产物再用氯仿或四氢呋喃溶解，再在乙醚或石油醚中沉淀，反复三次，最后真空干燥得到含磺酸基的聚(2-甲氧基乙基丙烯酸酯）。 The hemodialysis said bypass conduit claim 1, wherein said step 2) the following steps: after step 1) reaction, the product was added dropwise with constant stirring anhydrous diethyl ether or petroleum ether to give flocculent white precipitate was filtered, and the resulting product was then dissolved in chloroform or tetrahydrofuran, reprecipitated in diethyl ether or petroleum ether, repeated three times, and finally dried in vacuo to give the sulfonic acid group-containing poly (2-methoxy ethyl acrylate). 3. 根据权利要求1所述的血液透析用体外循环管路，其特征在于，所述步骤2)的操作步骤如下:利用步骤1)的产物，采用自由基聚合方法制备含磺酸基的聚(2-甲氧基乙基丙烯酸酯)。 The hemodialysis said bypass conduit claim 1, wherein said step 2) The procedure is as follows: Using the product of Step 1), using a radical polymerization process for the preparation of the sulfonic acid group-containing poly (2-methoxyethyl acrylate). 4. 根据权利要求3所述的血液透析用体外循环管路，其特征在于，所述自由基聚合反应中采用氮气保护，聚合的溶剂为甲醇、乙醇、异丙醇、氯仿、四氢呋喃、丙酮中的一种或任意两种或两种以上的混合物;反应所用的催化剂为偶氮二异丁腈或偶氮二异庚腈自由基引发剂。 The hemodialysis said bypass conduit according to claim 3, wherein the radical polymerization was blanketed with nitrogen, a polymerization solvent is methanol, ethanol, isopropanol, chloroform, tetrahydrofuran, acetone or a mixture of any two or more thereof; catalyst used was azobisisobutyronitrile or azobis isobutyl nitrile heptyl radical initiator. 5. 权利要求1所述的血液透析用体外循环管路的制备方法，其特征在于，该方法包括如下步骤： 1) 将质量百分比为1~25%的2-丙烯酰胺-2-甲基丙磺酸、质量百分比为50-75%的甲基丙烯酸乙酯和质量百分比为10-35%的甲基聚乙二醇丙烯酸酯混合并发生聚合反应，反应温度为30-90°C，反应时间为3-25小时； 2) 利用步骤1)的产物制备含磺酸基的聚(2-甲氧基乙基丙烯酸酯）； 3) 将步骤2)制备的产物配成质量比为0.1%-15%的溶液，采用共挤涂布方法在管路基材上成膜，得到目标产物。 Hemodialysis according to claim 1 prepared by the method of cardiopulmonary bypass conduit, characterized in that the method comprises the following steps: 1) the percentage of 1 to 25% by mass of 2-acrylamido-2-methylpropane acid, 50-75% by mass percentage of ethyl methacrylate and 10-35% by mass percentage of methyl polyethylene glycol acrylate and a polymerization reaction mixture, the reaction temperature is 30-90 ° C, the reaction time 3-25 hours; 2) using the step 1) preparation of the product of the sulfonic acid group-containing poly (2-methoxyethyl acrylate); 3) the product of step 2) preparation of the formulated mass ratio of 0.1% - 15% solution, co-extrusion coating method using a film on the substrate pipe, to give the desired product. 6. 根据权利要求5所述的血液透析用体外循环管路的制备方法，其特征在于，所述步骤3)中配制溶液所用的溶剂为甲醇、四氢呋喃、富马酸二甲酯、二甲基亚砜、二甲基乙酰胺、丙酮中的一种或任意两种及两种以上的混合物。 Hemodialysis according to claim 5, wherein the bypass conduit preparation method, wherein, in the step 3) was prepared solvent used is methanol, tetrahydrofuran, dimethyl fumarate, dimethyl sulfoxide, dimethylacetamide, one or any two of acetone and mixtures of two or more. 7. 根据权利要求5所述的血液透析用体外循环管路的制备方法，其特征在于，所述步骤2)的操作步骤如下:步骤1)反应结束后，将产物滴入不断搅拌的无水乙醚或石油醚，得到白色絮状沉淀，过滤，然后将得到的产物再用氯仿或四氢呋喃溶解，再在乙醚或石油醚中沉淀，反复三次，最后真空干燥得到含磺酸基的聚(2-甲氧基乙基丙烯酸酯）。 The hemodialysis according to claim 5 prepared by extracorporeal circulation conduit, wherein said step 2) the following steps: after step 1) reaction, the product was added dropwise with constant stirring in dry diethyl ether or petroleum ether, to give a white flocculent precipitate was filtered, and the resulting product was then dissolved in chloroform or tetrahydrofuran, reprecipitated in diethyl ether or petroleum ether, repeated three times, and finally dried in vacuo to give a sulfonic acid group-containing poly (2- methoxyethyl acrylate). 8. 根据权利要求5所述的血液透析用体外循环管路的制备方法，其特征在于，所述步骤2)的操作步骤如下:利用步骤1)的产物，采用自由基聚合方法制备含磺酸基的聚(2-甲氧基乙基丙烯酸酯）。 Hemodialysis according to claim 5, wherein the bypass conduit preparation method, wherein said step 2) The procedure is as follows: Using the product of Step 1), using a radical polymerization process for preparing acid-containing group poly (2-methoxyethyl acrylate). FR2471213A1 (en) 1981-06-19 Transparent water absorbing polymer mixts. - suitable for use as coating for catheters and sutures, contact lenses etc.